east side bride: what's that? a net-a-porter wedding boutique? If you wore a little something like this skirt by Chris Benz (with a different top, obv) could you justify going nuts on the shoes? These shoe boots by Alexander McQueen are not technically in the wedding boutique but that might be why I like them. Eff I could keep choosing wedding outfits until I turn 40.
i scoured their site looking for a replacement dress daily (shhh don't tell) and what?! now they have a whole section. that could have saved some time. 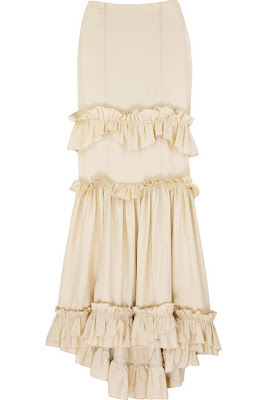 i love net-a-porter and my imaginary life that allows me to purchase all of their lovelies. And then you hit 50 and tada! you can start choosing your daughter's imaginary outfits...Without a daughter to outfit you might want to think about winning an Oscar instead. I so plan to scour your archives when it's my turn to wed.
CEVD? How are you looking for new dresses when I just stare at pictures fo your dress everyday and obsess about it. ESB, you probably will win a Oscar. I'll hold your bag. Hey just a nomination would be an excuse to buy a dress. Know what I'm saying? her dress is good, but it's the shrugggggggggggg. oh the shrug. I know, that boutique is pretty awful. And by "awful" I mean extremely tempting. And I'm not even planning a wedding! Think I could wear that skirt on, say, a Tuesday? I think you can always justify going nuts on the shoes.